Girls Night Out at Tanger Outlets was held recently to honor a cancer patient or survivor with a balloon launch. Guests then had a chance to learn about breast cancer, general women’s health and also shop with local vendors who were in attendance. This year’s honoree (middle) is Dianna Hawes, store manager of Chico’s and White House Black Market at Tanger Outlets. Pictured with Hawes are Trent Lemle, Fayette County Memorial Hospital, FCMH CEO Mike Diener, and Kristen Hauer, Tanger Outlets Jeffersonville general manager. 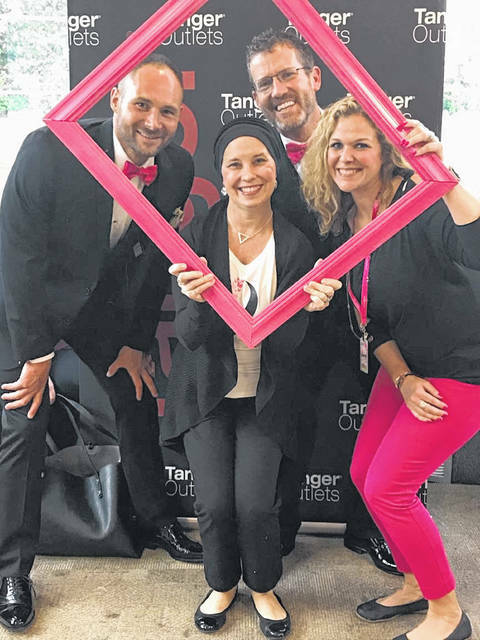 https://www.recordherald.com/wp-content/uploads/sites/27/2018/10/web1_10773.jpegGirls Night Out at Tanger Outlets was held recently to honor a cancer patient or survivor with a balloon launch. Guests then had a chance to learn about breast cancer, general women’s health and also shop with local vendors who were in attendance. This year’s honoree (middle) is Dianna Hawes, store manager of Chico’s and White House Black Market at Tanger Outlets. Pictured with Hawes are Trent Lemle, Fayette County Memorial Hospital, FCMH CEO Mike Diener, and Kristen Hauer, Tanger Outlets Jeffersonville general manager.